GARY Caldwell hailed ‘a great...fantastic week’ after seeing his Wigan Athletic side pick up seven points from a possible nine to move into the League One play-off places for the first time this season. 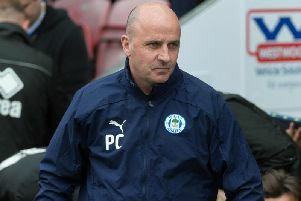 Latics followed up back-to-back wins over Colchester last weekend and Peterborough in midweek with a creditable point at Bradford, who themselves have hopes of being involved in the promotion shake-up. Michael Jacobs gave Latics the lead at the start of the second half, with James Hanson scoring a deserved equaliser for the home side at the three-quarter mark. But Caldwell’s men are now unbeaten in nine matches, and the manager couldn’t be happier with the way things are going. “It’s been a great week, a fantastic week for us,” he told the Evening Post. “We’re moving in the right direction, moving up the league, making progress, and that’s the really positive thing for us. “We’re another game unbeaten, and it’s important to have that feeling in the camp. “We’ve tried to build that winning mentality throughout the club, and it’s something we’re determined to build on. “It’s been a long week, with two hard away games in addition to the travelling. The Latics defence had to withstand an onslaught from the home side, who won 15 corners and pumped countless balls into the visitors’ box. For the main part the Latics back five stood up to the test, cracking only once when Hanson was able to plant a free header past Jussi Jaaskelainen from Tony McMahon’s corner. “It’s a tough place to come, with a big home crowd and a team that makes you defend and asks you a lot of questions,” acknowledged Caldwell. “We worked a lot this week on defending corners and throw-ins, because we knew that was their main threat. “I thought we stood up to a lot of it, although we gave them too many set-pieces. “We were probably always going to get punished by one, and that’s the way it turned out. “It was soft the way it went in, between Reece (James) and Jussi, who was unsighted by Devante Cole, and it’s sneaked in. “But in terms of the way we defended for the rest of the game, I couldn’t have asked for any more. The home side were extremely unhappy at the way Latics took their lead, with Jacobs finding the net while home striker Hanson was on the floor, apparently injured, after a collision with David Perkins. That wasn’t the only contentious decision, with both benches voicing their frustration to each other and referee Richard Clark during a heated contest. “It’s a great atmosphere, a great stadium, and the adrenaline was really going,” assessed Caldwell. “Both managers and both sets of staff want their teams to win which means it gets animated, but it was all in good spirits. “For our goal, there was a collision, everything happened so quickly, we picked up the ball and played it, and scored. In the end a point was probably a fair result, with the standard of entertainment on show a great advertisement for League One football. “Every game this season has been excellent in terms of the application and the honesty of every player,” added Caldwell. “There’s also a lot of quality on show in this league.